The oldest shop in Kiruna is Carl Wennberg AB, a gift store and specialist in Sami handicraft. It is situated in the heart of Kiruna town. Built in 1907 by Franz Gustaf Wennberg, it was originally a general store. The son of F.G. Wennberg was born in America, and together with his wife Greta later took over the store. Their great interest for the Sami and Sami handicraft gradually made handicraft the company´s signum. Today the store is run by F.G Wennbergs grandson Karl. Carl and Greta didn´t just sell handicraft, they were also collectors of Sami art. Their home was situated next to the store and became a museum which attracted people from far and near. The collection today belongs to the Swedish state-owned mining company LKAB and is displayed in the venerable old company hotel in Kiruna. Greta Wennberg herself was a great artisan and had an eye for quality and originality. One of her protegées was Nils Nilsson Skum, the greatest Sami artisan ever. Greta is one of the few women with a street named after her in Kiruna. Finally, we would like to tell you a little story about the colorful couple Carl and Greta Wennberg. Almost daily, Sami people came to the Wennbergs’ shop to sell their handicraft items. One of them had however decided to go to Abisko and sell his winter production to the tourists there instead. When he told Greta Wennberg about this she wondered if he could bring some of the collection from her store and sell at the Abisko market for a commission. The Sami agreed to this and when he went to Abisko he brought with him a bag of price-labeled goods from Wennberg´s well-stocked showcases. In Abisko the Sami artisan displayed his goods in front of the tourist station. After some time Carl Wennberg happened to pass buy. He got mightily impressed by the quality of the handicraft items and bought everything that was for sale on the go, without even trying to bargain. What his wife told him when he got back home with his “bargain” the story doesn´t tell! Nevertheless, we do know that Greta Wennberg payed the commission to the business minded Sami without grumbling. Text from the book “Kirunas first century” A 100 years chronicle compiled by Åre Barck. We have for a long time talked about making a tribute to Greta Wennberg, a fantastic artisan and businesswoman of her time. We have chosen seven motives and printed them as graphic posters on high quality paper, with the help of a local printing company here in Kiruna. We want her beautiful motives to reach a wider audience. 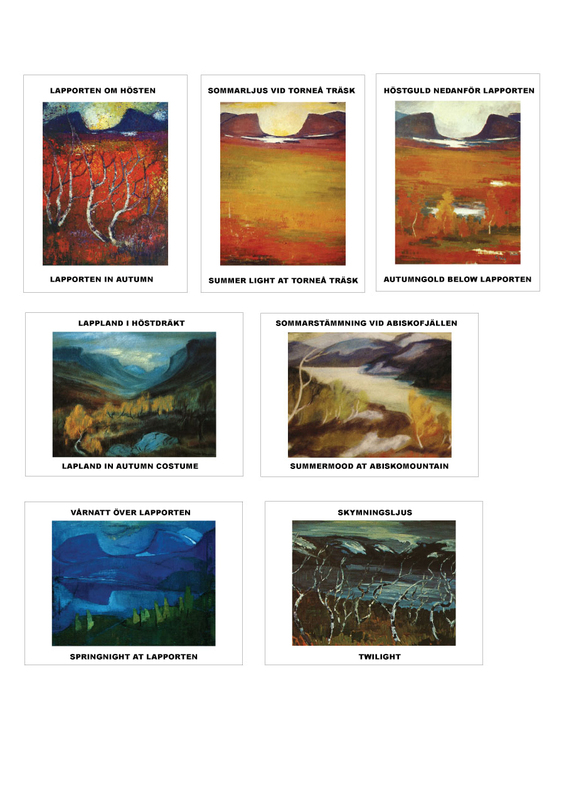 Her time in Abisko is reflected in many of the beautiful motives, especially the mountain pass Lapporten “The Lapponian Gate”, which is central to many of her works.